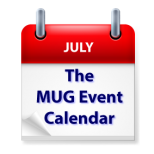 The top events on this week’s MUG Event Calendar on the are mobile movie making at a California creative pro group, freelancing at an Ohio group and macOS Sierra in Florida. Los Angeles Creative Pro Users Group – The idea of making a professional movie using your Smartphone or iPad is no longer an idea. Join us as we welcome Taz Goldstein who will show us many of the top apps you need for professional mobile movie making. Also Dave Basulto of iOgrapher fame will join us to show off hardware accessories for the mobile filmmaker. Also, Karl Lee Soule of Adobe, will be here to show their mobile apps.